The Apgar Award for Innovation in Teaching rewards faculty members early in their careers for innovative teaching initiatives and recognizes courses that “cross traditional academic boundaries and that are likely to have practical applications in students’ lives,” according to the DCAL website. Students who have taken classes with Korsunskiy and Robbie said they appreciate the professors’ dedication to students’ learning. Piloted in 2018, the “Senior Design Challenge” is a capstone course available to seniors of all majors and counts for two credits toward the human-centered design minor. Interdisciplinary teams of students use human-centered design methodology to ideate and prototype a design project, Korsunskiy said. The course was formally approved after its pilot year and is now offered this winter and spring. Student projects are planned in partnership with community organizations across a broad range of industries, according to Korsunskiy. 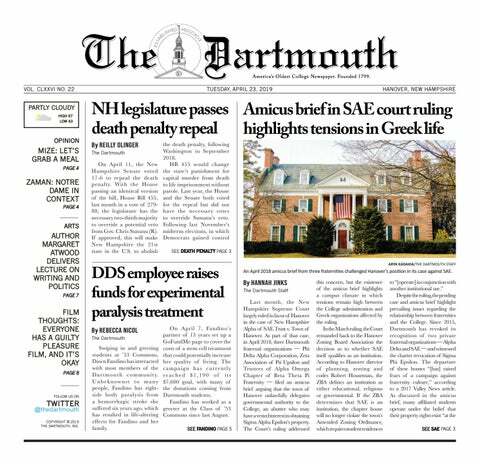 The course collaborates with the Dartmouth Center for Social Impact to establish connections with client organizations. In the past, these have included Efficiency Vermont, Upper Valley Haven, The Dartmouth Institute, Peter Sheehan Diabetes Care Foundation and Burton Snowboards. This year, Center for Social Impact associate director Ashley Doolittle helped expand the list of organizations, Korsunskiy said. According to the course website, the output of a team’s project can be anything — possibilities include a physical product, an app, a service, an experience, a brand or a startup. During the winter term, students brainstorm ideas, research their chosen issue and analyze data. Their research includes engaging with their issues’ stakeholders and compiling information from secondary sources. In the spring term, students engage in an iterative cycle of prototyping, receiving feedback and refining. Students who took the course in its pilot year conducted an eclectic array of projects. Madison McIlwain ’18 said her team worked with product managers at Burton Snowboards to design a landing page, which helps users navigate the company’s website. Zoe Thorsland ’18 said her team introduced a feedback loop at the Upper Valley Haven, bridging the gap between service providers and users.